First off, the following post reprints page 305 from my book A Dirty Old Man Goes Bad. For 30+ years I’ve kept a diary trying to make sense of my own life; but this section about the Ponte Vedera Shipwreck explains why I publish some of these recent diaries. Next, I’m reprinting an exciting e-mail from Chuck Meide, chief archaeologist for LAMP (Lighthouse Archaeological Maritime Program) at the St. Augustine Lighthouse. His website can be found at http://www.staugustinelighthouse.com/lamp.php . 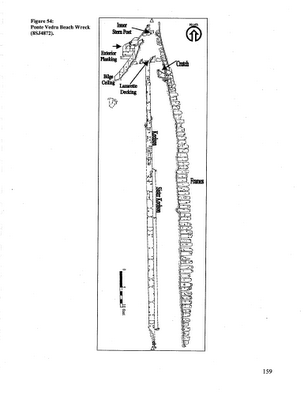 And finally, there is a long link is to LAMP’s 2001 Report which details the findings of marine archeologists exploring the wreck. (I think you have to be signed on to Google or to G-mail to read this PDF document). I find all this elating! A few years ago my friend Wes and his brother explored a shipwreck site on Ponte Vedra Beach, a few miles south of Jacksonville, Florida. Just before Christmas, Wes gave me a set of photos of the wreck to post on my website. Every once in a while as hurricanes surge up Florida’s east coast, the wind and waves and tides uncover things buried in the sands of the beach. When I was a boy, I heard about a man who, as he strolled the beach down south of here, found an 18-foot-long chain made of heavy gold links. And on this gold chain hung a cross studded with emeralds and rubies It had been buried in the sand for centuries, debris from a Spanish galleon’s wreck in the 1500s. Yes, the waves uncover odd things in the sand. But the sand washes back in to cover all sorts of things too. I’ve seen cars, parked on the beach for only a few hours, completely covered by sand so you can only see the roof and radio antenna. Docks disappear beneath the sand and even whole houses. Then, after a time long or short, the tides uncover them again. 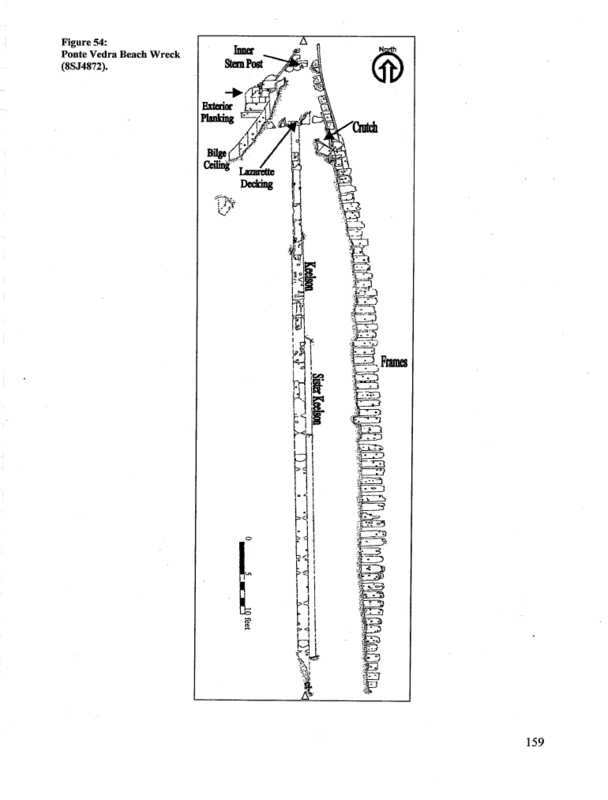 I’ve heard of ancient Indian dugout canoes which were buried in the sand being uncovered by the moving waters. My friend Wes has no idea of the name of the ship he and his brother found, but he did take photos of the Ponte Vedra shipwreck. I’ve tried to Google search Florida shipwreck sites without being able to find any information at all about this particular ship. 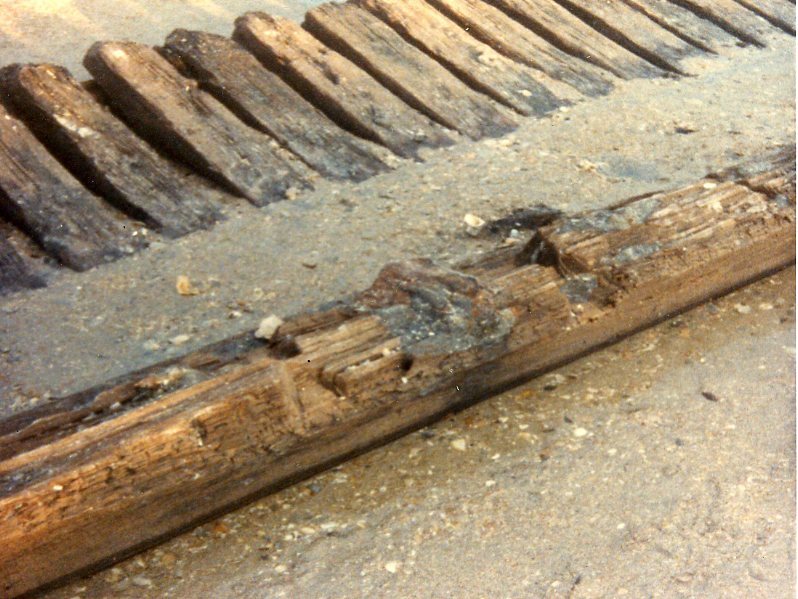 The hand-hewn timbers and rusty square-cut nails indicate it is an ancient wreck. If anyone out there in the Blog World has any information about this ill-fated ship, I’d appreciate an e-mail. I chose today to post these shipwreck photos because today marks the one-year anniversary of my venture into blogging. In that year I’ve seen many things uncovered within myself that I thought were safely buried beneath the sands of time. Waterlogged timbers from the shipwreck of my life, rusty twisted wrought-iron ideas, sharp slivers of broken glass from my past … but even, now and then, a tiny flake of gold. In ways, I feel exposed, ashamed, uncovered, when I realize that people read my posting – the counter software says about 13,000 readers of the blog in this first year and scads more readers on the website. Yet, like a ghost crab, I’m tempted to scurry for cover and burrow back under the sand when exposed to light. It’s uncomfortable to be so vulnerable. I feel I am a singularly unsuccessful man, a looser, a washout,. a shipwrecked soul, a man Christ rescued by the skin of my teeth. Other men have to drink heavily to get to where I am in life. And I got here sober! Yet I feel there are a lot of beachcombers out there in the world, people wandering the beach hoping to find something of value in the litter washed up by the tide, people searching for a flake of gold, people hoping to find something worthwhile leftover from a floundered ship -- or from my floundered life. I write with these beachcombers in mind, thinking they may find something useful in the shipwreck site that is my life. So, I let the tide wash over me exposing worm-eaten timbers and broken crockery and shipwrecked dreams -- and an occasional bit of glitter worth putting in your pocket. I try to be honest in this blog, writing happy things and pleasures as well as frustration and despair; temptations and failures as well as giddy joys. You’ll find a lot of plain old aluminum tab tops when digging through my blog. But every once in a while, maybe someone will uncover a cross in the sand. That’s what I hope they’ll find. Or, maybe my musings are just flotsam and jetsam which should rightfully be covered by the sands of time with no loss to anyone. But, nevertheless, I keep on believing and I keep on writing. I came across your webpage, and in particular the photos of the old wooden wreck at Ponte Vedra Beach which you have posted (http://www.cowart.info/MyWeb_001.htm). You requested that anyone contact you if they had info on this wreck. My name is Chuck Meide, I am the chief archaeologist for LAMP (Lighthouse Archaeological Maritime Program) at the St. Augustine Lighthouse. Back in September 2001, archaeologists from my program (this was before I took the job) visited the wreck which had been uncovered by Tropical Storm Gabrielle. 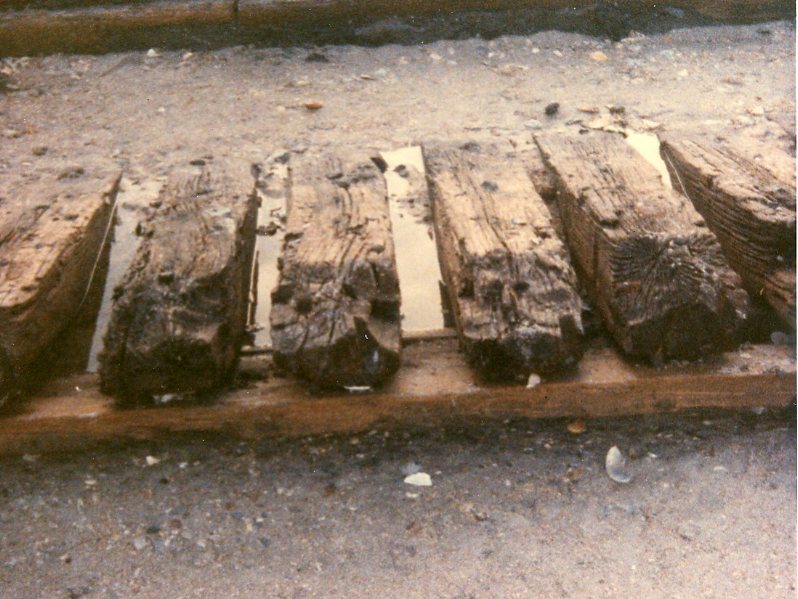 They recorded the hull timbers before it was naturally re-buried. While it remains unidentified, it is believed to represent the remains of a late 19th century coastal trading schooner, probably at least 150 to 200 feet in length. I have attached a section from our 2001-2002 report which details the investigation and description of the wreck. I hope you don't mind, I've downloaded copies of the photographs you have posted for our records. 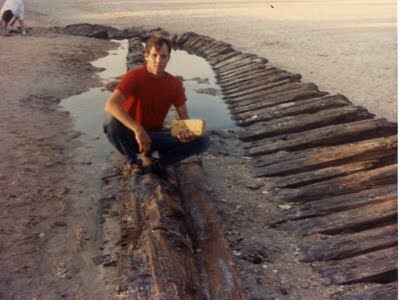 I'm sure this wreck is periodically exposed, as it was in the mid 1980s when your friends took these pictures. If you have any further questions, please don't hesitate to contact me. If you have any further information about this wreck that you think we might be interested in, please let us know. I saw a brick in your photos, there was no mention of this in our report so any exposed bricks may have all been taken by beachcombers by the time archaeologists visited the wreck, so that is of interest to us. Anyhow, recently my life revolves around purely clerical work on that Florida History Materials Sale Catalog and puzzling over incomprehensible software programs I’m told I can’t do without. So to think that some photos I posted five years ago actually are of interest to a professional archaeologist… That’s made my day. 1 Cast thy bread upon the waters, for thou shalt find it after many days. 2 Divide a portion into seven, yea, even into eight; for thou knowest not what evil shall be upon the earth. Your work sure can be compared with casting bread upon the waters. I keep finding food for thoughts and soul every time I come by. I sure understand your joy by being acknowledged by a professional. You have fed him as well. I am literally, what you call a beachcomber, not looking for gold, but driftwood and seashell. I always carry a rucksack to bring my findings back home. My friends recently helped me carry a log from an old keel, with wood pegs instead of nails. Nothing for the archeologists, though. It had been laying on the beach for a year, and was only a mere fragment. To me a treasure, now placed beside the fireplace. Aren't we rich, both of us? I'm a Christian of sorts and I get a kick out of writing a religious humor website called The Rabid Fundamentalist at www.cowart.info. I hope you enjoy reading my work. -- John. Mary? Eleanor? Where Are You?